Make this dish in advance – it’s so easy to assemble before serving. Squeeze the juice from the clementines and lemons. Pour 100ml into a small saucepan. Put the star anise in a blender or food processor with 2 tbsp of the caster sugar and blend until the spice is broken into small pieces. Tip into the pan with the remaining sugar and heat gently until the sugar dissolves. Bring to the boil, remove from the heat and leave to cool completely so the star anise flavours the syrup. Strain the remaining fruit juice through a sieve into a shallow freezer-proof container and the vodka if using. Strain the spice syrup through the sieve into the juice, pressing the pulp through with the back of a spoon and mix. Freeze the mixture for 2–3 hours or until partially frozen around the edges. Use a fork to break up the mixture, pushing frozen parts into the centre so the consistency becomes mushy. Freeze for another 1–2 hours until once again frozen around the edges and break up with a fork. Repeat once or twice more until paler in colour and evenly frozen in loose flakes. Whip the cream with the cinnamon or caster sugar until it only just holds its shape. 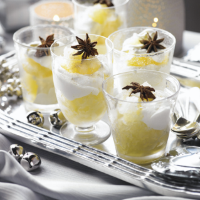 Spoon a little granita into glasses and top with a spoonful of cream. Top with more granita and another spoonful of cream. Decorate with whole star anise and serve immediately.